I grew up in Northern Illinois. I attended Freeport High School. And after my service in the United States Army, I came back to Freeport, because its home, and began my law enforcement career. I care about our families. I care about our teachers. And I care about our students. Our students are the future. Many of them dont quite realize it, but the decisions they make matter. Making good choices isnt just better for the world around us. Its better for each of us too. That is why I worked to have Erika Harold return to share her story with students in Freeport and Lena. It was a little over twenty years ago when, Erika Harold then a college freshman, first came to visit Freeport and Lena. She came to tell our students about her experience being bullied in high school. She came to give them guidance, and to offer hope. Last Wednesday she returned to share the same message with the next generation of our students and to tell the students what she has done with her life to overcome challenges and to encourage them to do the same. 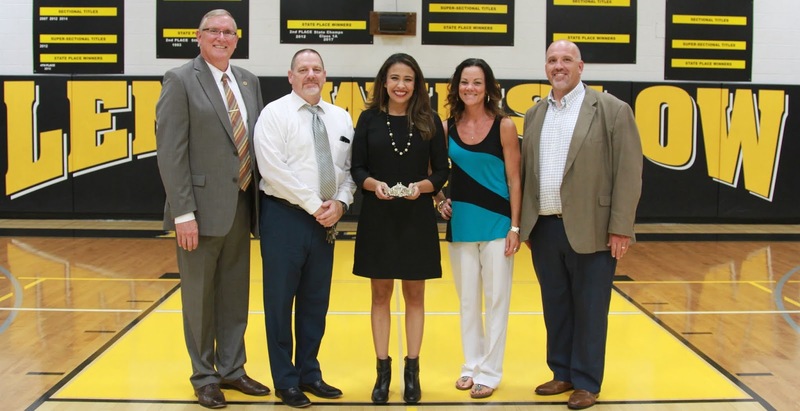 After her high school experiences, Erika Harold went on to become Miss Illinois and was crowned Miss America 2003. She used the scholarship money from the pageant to attend Harvard Law School and graduated debt free. What she didnt talk about was her candidacy to be the next Illinois Attorney General. I want to thank Freeport High School Principal Beth Summers, Middle School Principal Renee Coleman, and their staff for helping arrange each of the assemblies with the high school and middle school girls in the Jeannette Lloyd Theatre. I would also like to thank Lena-Winslow District Superintendent Tom Chiles, Principal Mark Kuehl, District Counselor Leslie Price and their staff for organizing the assemblies first with the elementary students, and then with the middle school and high school students in the high school gym. I had never heard Erika share her story. At least, I hadnt heard all of it. She grew up in Champaign-Urbana. Her mother is African American, and her father is Greek-German. She was one of the few minority students in her high school, and because of that, she was bullied. She was called names, including racial epithets. She was subject to the uncool game where students would observe her during the class period and write down everything she did. Towards the end of the period, the teacher would allow students to come up to the front of the classroom and read all of the things the uncool Erika did. She did not tell her parents. They only discovered what was happening to her when they found a note she was writing to a friend. When confronted, the administration and the teachers would not act to stop the bullying. Then it escalated. Things were thrown at her home and through the windows. They lost power to a part of their house when some cables were cut outside. Eventually, her parents chose to enroll her in another school. Erika challenged educators. She said, When you see people in power standing by and allowing something negative to happen, it sends a message that whats happening is ok.
She left our students with three things. First, dont accept what the crowd says about you. Its easy to shrink when people put a spotlight on us in a negative way. Its easy to retreat when others try to hurt us. She said, You will always regret not stepping up to embrace the fullness of who you were created to be. Second, defend each other. She recalled another student whose family was not as well off as his classmates parents were. He was bullied for being poor. To this day, she regrets not standing up for him. She didnt bully him, but she wishes she had said something. Its not only important to stand up for yourself. Stand up for each other, she said. Lastly, she encouraged our students to find a cause to fight for and to make a difference in the world. She took her experience and used it to help other students understand they were not alone. She used it to challenge bullies. And she used it to change policies in schools across the country when it comes to making sure that classrooms are a safe environment for our children. This was the story our students heard. At some point, between when students entered the auditorium, and when Erika finished sharing her story, our students became engaged. High school students asked deep and penetrating questions about what she went through, and the entire room was supportive and attentive. They applauded each other for asking questions. Our middle school students supported their friends who chose to share their own gifts and sing or dance on stage. Its hard to be a kid today. We know its hard. 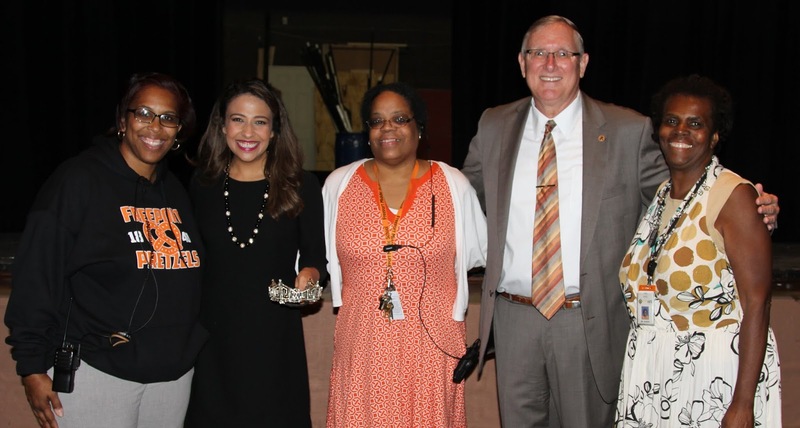 But for the hour almost 1,400 students spent with Erika Harold on Wednesday, we watched something extraordinary. Our students became united in a common cause to support each other. In that hour they became a community. It was awesome. It was inspiring. And my hope and prayer is that the community they discovered together on September 12th keeps on keeping on.